Kids love to play with water balloons. 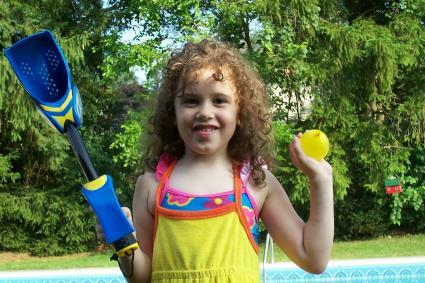 LoveToKnow Toys had an opportunity to review the KAOS Nemesis Wrist Launcher water balloon toy. The reviewers included a five-year-old water balloon toy fan. Learn how the KAOS water balloon launcher works and if it is holds up for serious water balloon play. The KAOS Nemesis Wrist Launcher, aka Nemesis Water Balloon Launcher, is a simple plastic gadget with a handle and a curved cup in the front for launching water balloons. The toy is made out of a thick, durable plastic in blue, yellow, black and silver colors to create a sporty look. It also features an easy-to-grip non-slip handle. This gadget does not need batteries to operate. It only requires water balloons, and comes with a set of 50 KAOS Water Bomb water balloons as well as a hose spigot. The spigot makes it easier to fill the balloons. The manufacturer claims that people can potentially launch water balloons over 100 feet with the toy. The launcher has a manufacturer suggested retail price (MSRP) of $14.99 and is recommended for children eight years-old and up. 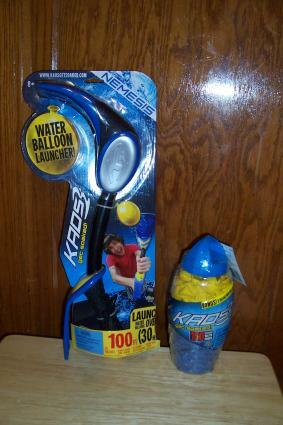 LoveToKnow Toys received two free review copies of the water balloon launcher and two 150 count containers of the KAOS Water Bomb balloons from the Imperial Toy Corporation. The product is designed to work with KAOS Water Bombs water balloons but it can work with any water balloons. The KAOS brand balloons are sold in large sets of 150 and have an MSRP of $5.99 per set. Two hose spigots come with each set. 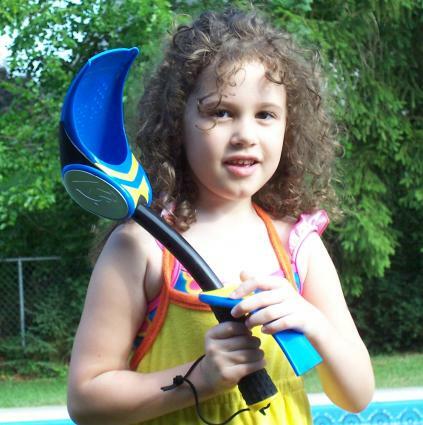 The reviewers found the hose spigot essential for filling the water balloons with a garden hose. It was difficult to fill the balloons manually without the spigot. To use the spigot, you screw it onto the hose and then attach a balloon to the end. The directions on both the launcher and the water balloon container did not explain well how to use the spigot. The reviewers discovered that it was best to carefully hold the balloon opening on the spigot as you filled it and to only use a small amount of water. If the water comes out too fast, the balloon goes flying unfilled and you may get a bit wet. The directions indicated that it was best to fill the water balloon to about the size of a baseball. The launcher has an outline of the ideal size for the balloons on the packaging for reference. The reviewer filled the balloons both smaller and larger than a baseball. The balloons have the capacity to fill to double the size of a baseball and still be tied and used in water fights. Launching from the shoulder area helps throw balloons farther. Since the Nemesis wrist launcher is a manual water toy, the skill of the player will determine how far a water balloon can be launched. Operating the toy is easy. You simply load the launcher cup with a water balloon and launch the balloon with a flick of the wrist in the direction of your choice. The child reviewer discovered the toy works best when you hold the launcher up by your shoulder, load a balloon and then throw the balloon. She was able to get the balloon to travel a longer distance with this method. She also found that following through with the launching motion in one fluid movement gave power to the throws instead of short flicks of the wrist. Did the reviewers make the balloon travel over 100 feet? No, but the mother and daughter reviewers certainly had fun. The KAOS Nemesis Wrist Launcher water balloon toy is a modern spin on water balloon fighting. Although the launcher and the balloons are reasonably priced, bear in mind that you will need two launchers in order to have a balloon fight between two competitors. The gadget works but using the toy does not guarantee that you will launch a water balloon over 100 feet despite advertising. The toy is intended for ages eight and up, but younger children may still be able to play with adult supervision. Fans of water balloon fighting will find much to enjoy in this toy.